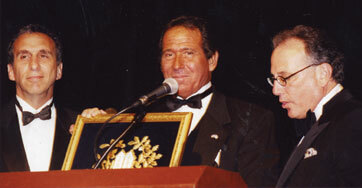 1995 - Inducted into "Who's Who in America"
Robert receiving the Jewish National Fund Award. 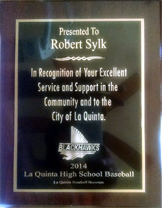 Palm Desert resident Robert Sylk credits his family for his commitment to help others. "Being a truly responsible part of the world we all live in was ingrained in me very young. 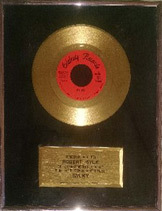 It was a part of my life," he says. 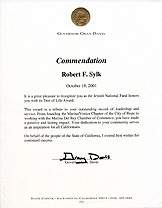 The Palm Desert resident’s dedication is being recognize by the Jewish National Fund, which has named Sylk this year’s winner of the prestigious "Tree of Life" tribute. 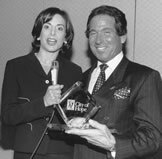 He will be honored at a dinner on Oct. 18 in Beverly Hills. 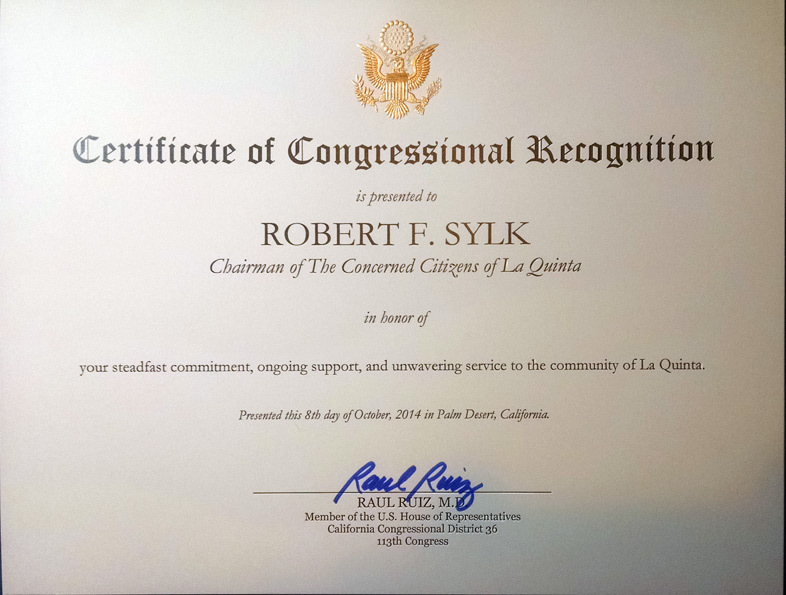 Certificate from Senator Jim Battin acknowledging Robert's contribution to the La Quinta Chamber of Commerce. 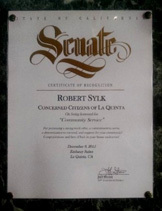 Certificate from Senator Denise Ducheny acknowledging Robert's contribution to the La Quinta Chamber of Commerce. 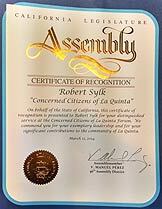 Certificate from Assemblywoman Bonnie Garcia acknowledging Robert's contribution to the La Quinta Chamber of Commerce. 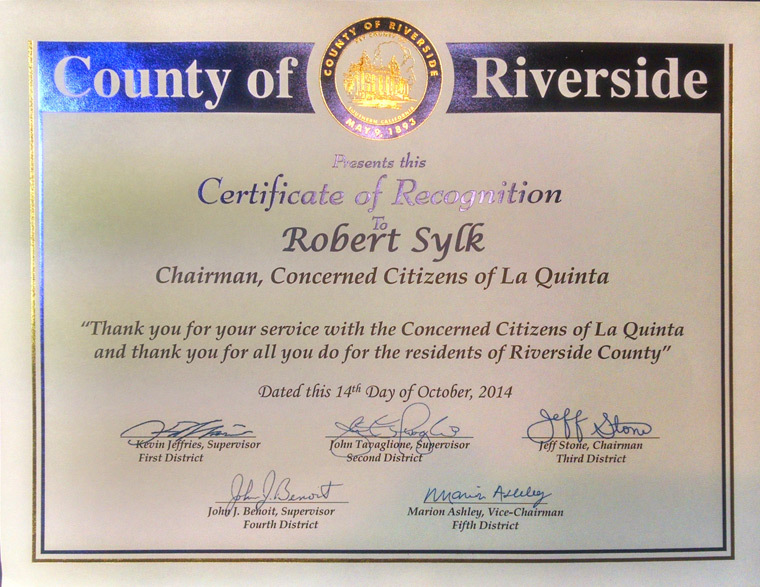 Certificate from Supervisor Roy Wilson acknowledging Robert's contribution to the La Quinta Chamber of Commerce. 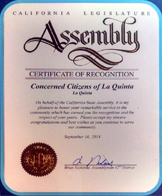 City of La Quinta Certificate of Appreciation Veteran's Day tribute. 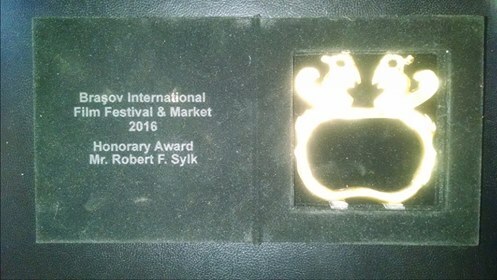 Robert Sylk receives City of Hope Award. 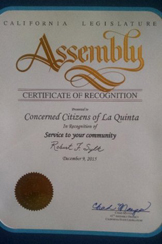 Certificate of Appreciation awarded to Robert from La Quinta Mayor Don Adolph. 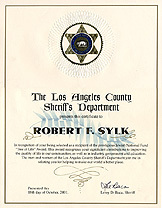 Certificate of Appreciation awarded by Norwich University. 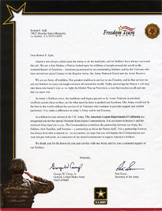 Freedom Team Salute Commendation awarded by Pete Geren, Secretary of the Army. 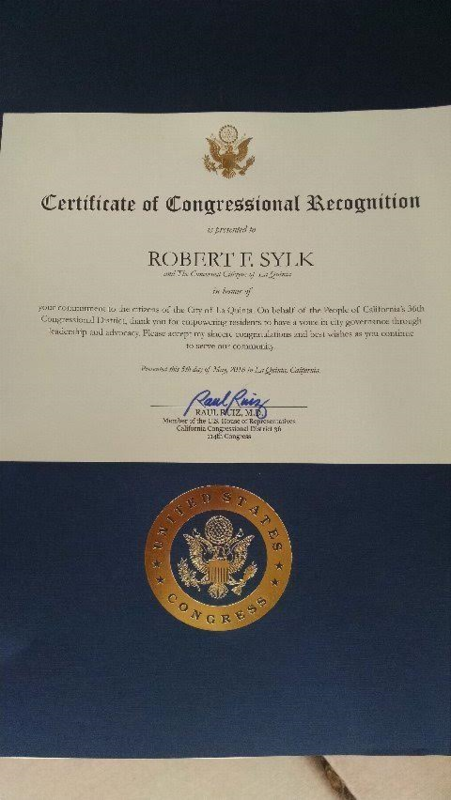 To Robert F. Sylk for his dedicated service as president of The City Of Hope by LA County Supervisors. 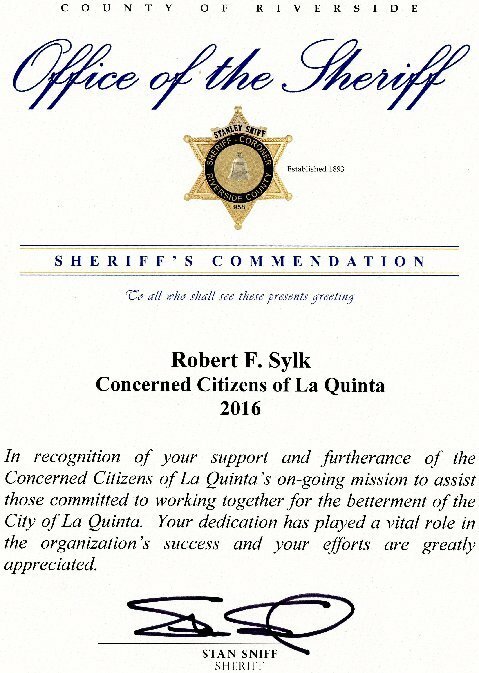 Presented to Robert Sylk by US Congressman Ruiz for his exemplary service to the community May 5, 2016. 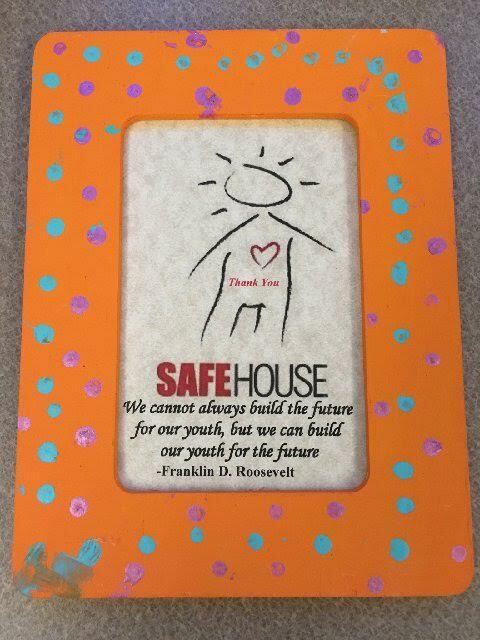 SafeHouse of the Desert Award. 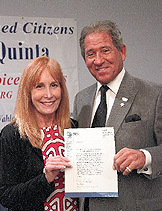 Certificate of Appreciation from Los Angeles mayor James Hahn. 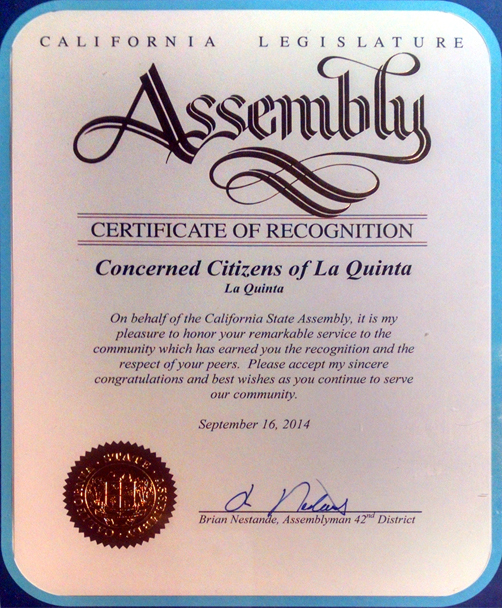 Certificate of Appreciation from United States Senator Barbara Boxer. 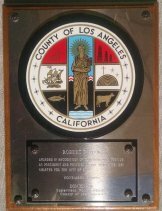 Robert is a proud member of the National Recreation and Park Association. 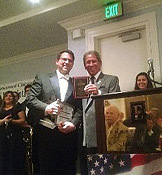 Veterans of Foreign Wars "Commander-in-Chief" Award presented to Robert F. Sylk by the Adjutant General and Commander-in-Chief honoring his support to over 200,000 Veterans who served our country.